I'm flying home from my seventh wine bloggers conference--I've been to four out of five in North America and three out of four in Europe. 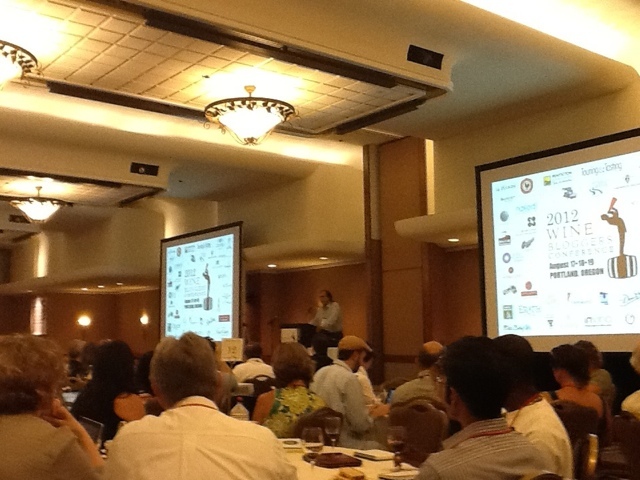 WBC12 was another well run event which brought together the ever-growing wine blogging community. 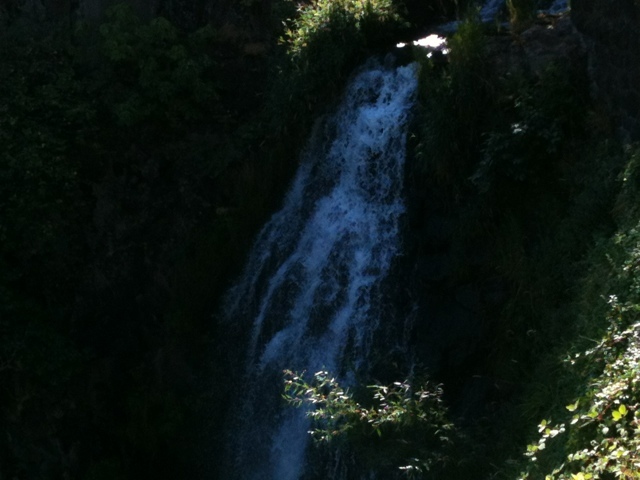 #1 Oregon is even more beautiful than I expected. 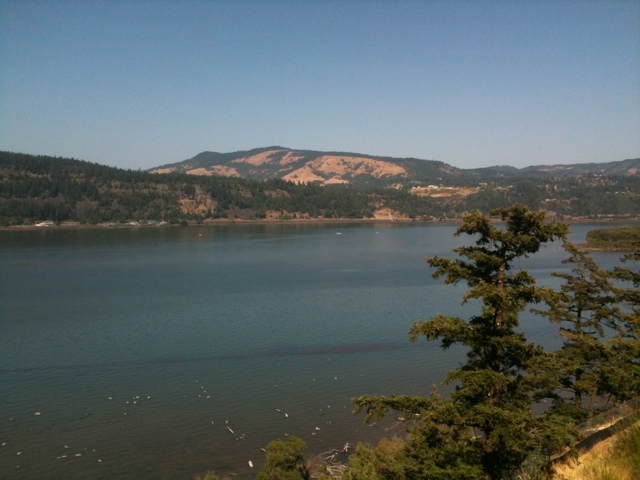 Having never been to the Pacific Northwest, I was truly looking forward to coming here. 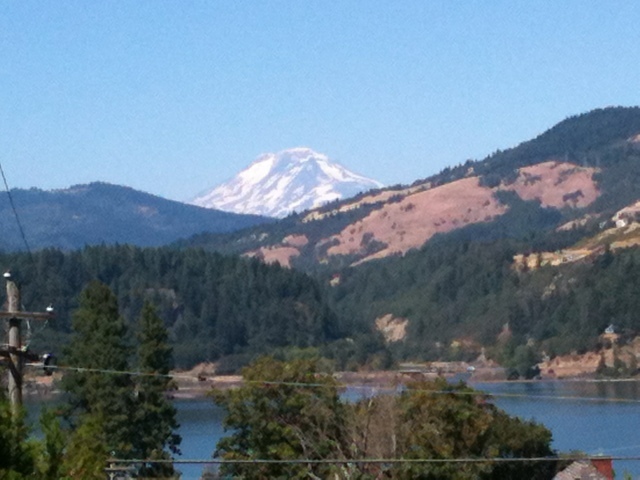 As I was Stand up Paddleboarding on the Columbia River, I looked up and saw snow capped Mount Hood rising over pine-covered hills. Its magnificence took my breath away. #2 Oregonians are incredibly nice. As an East Coaster, I was blown away by the genuine niceness, consideration, and polite demeanor of the natives. Even the briefest encounters included pleasant conversation and warm smiles. #3 The people are the best part of wine blogger conferences. I have so many friends in this community that I spent nearly the entire first evening just squealing and hugging as I saw each familiar face. But I also made what could be a valuable new contact and solidified another important relationship. #4 Oregon doesn't make one-size-fits-all wine. Every wine lover knows about Oregon Pinot Noir, but I discovered it can be stylistically all over the map: big, spicy, and dense with fruit, or delicate, pale, and earthy. 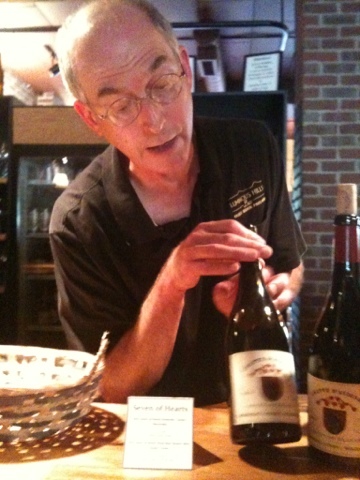 Plus, with Pinot Gris, Syrah,and many more, the state has a lot of varieties to try. #5 Wine blogging isn't going anywhere. Five years ago when our small (less than 150) group of bloggers descended upon Santa Rosa, California, for the first Wine Bloggers Conference, we had no idea how this community would grow. This year, there were more than 350 attendees. I met many people who began their blogs just this year, and, amazingly we all are finding something different to say about this seductive beverage. 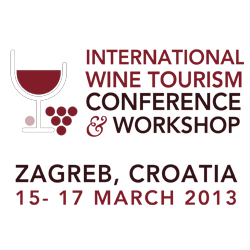 The fifth annual International Wine Tourism Conference will be March 15-17, 2013 in Zabreb, Croatia. Registration for the event is now open. Croatian wine is increasingly being recognized on an international stage, even more remarkable because the country produces large quantities of its native varieties such Plavac Mali and Malvazija Istriana rather than international darlings like Merlot or Chardonnay. In addition, the country of Croatia, just across the Adriatic from Italy, is a fascinating destination, with rich culinary traditions that reflect its crossroads culture such as salami with Paprika - a little Italian, a little Hungarian. 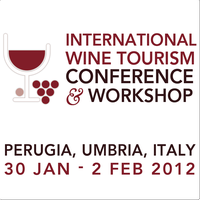 The three-day conference features a very international perspective, as presenters come from around the globe to give their unique views on the state of wine tourism. The International Wine Tourism Conference is relevant for anyone in the travel business who is looking to expand their tours to wine country, operators who want to get more bang for their wine-travel buck, and wineries that want to learn how to attract more visitors. Campania is an Italian region that encompasses Naples and the coastline and inland to the south. The region is home to a number of indigenous varieties that are still being produced today. At a dinner at Hotel il Molino as part of the International Wine Tourism Conference fam trip, I had the good fortune to dine at their chic and modern restaurant, sampling their chef's fine cuisine with a number of Campania wines. The menu was exceptional: crispy polenta with a beef meatball, squid sausage on toasted bread with a pizzaiola sauce, tortello of caciocavallo cheese (a local specialty) with a cream of Paestum artichokes, slow cooked Marchigiano beef with carmelized onions. This fine meal, made with locally sourced ingredients, was served alongside a host of local wines. While a rule of thumb in the wine world is often whites to the north, reds to the south, the southern clime of Campania is perfect for growing wonderful indigenous white wine grapes. Two of the wines stood out to me that luxurious evening. 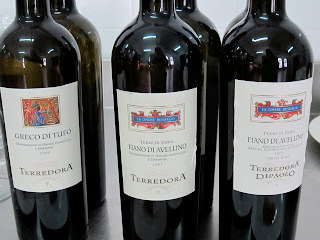 The 2010 Fiano d'Avellino from Terredora winery was round on the palate, with peaches, lemons, and intoxicating floral aromas. The 2009 Fiorduva from the Marisa Cuomo winery was also a stand-out. This wine is a blend of Fenile, Ginestra, and Ripoli. The grapes all grow on Dolomitic calcareous rocks on terraced vineyards that face the Mediterranean Sea. 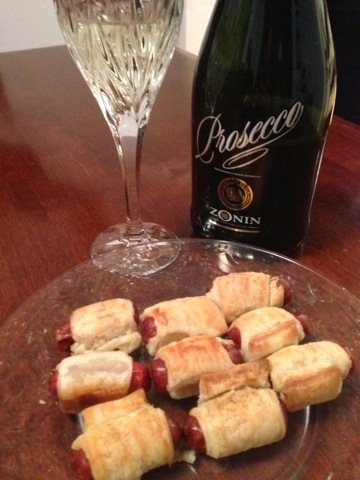 The Fiorduva had a lemony zing that complemented the squid sausage magnificentlly. With summer coming, look for the white wines of Campania to cool off. This distinctive, flavorful wines will make you forget about Chardonnays and Sauvignon Blancs and give your mouth a reason to celebrate. Last week I had the pleasure to see Lonely I'm Not at Second Stage Theater in New York City. The play, which featured a dynamite cast including the all-grown-up Topher Grace of That 70's Show, was a dynamic modern day romance. However, what really struck me from a wine point of view occurred before I entered the theater. That's because my Pinot Grigio was served in, well, a sippy cup. Oh! So I can bring it into the theater. How civilized. No more frat party chugging as the lights flash. 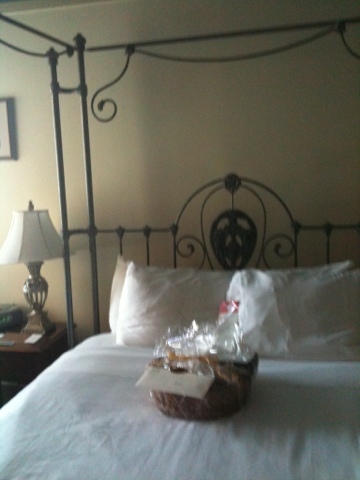 It was a thoughtful touch at a lovely venue. If you're in New York, go see Lonely I'm Not. And take your time with your wine. Roanoke Vineyards on the North Fork of Long Island has a Chardonnay called The Wild! that provides flavor, satisfaction, and a little bit of funk. 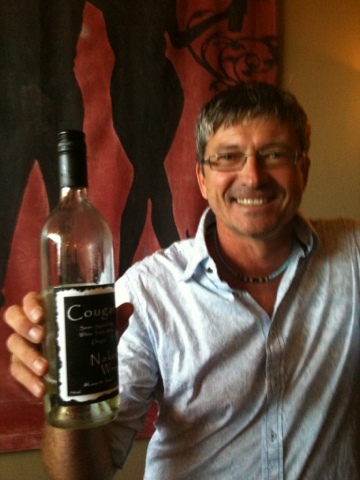 I recently tasted the 2010 vintage of The Wild!, which goes far beyond the typical flavor profile of new world Chard, which, to my palate, tastes fruity but often comes up short. The Wild! has a nose of limes and peaches. When I drank it, I immediately responded to the its full body, and I loved the complex flavors, which were tart and somewhat citric but also had hints of grass and a satisfying, long finish that was reminiscent of mushroom. This really is a wild child Chardonnay! 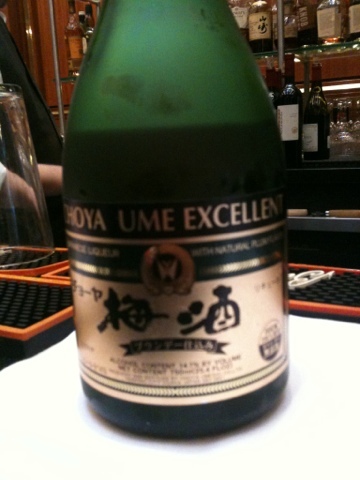 The name is a nod to the use of wild yeast in the fermentation. Now, playing with wild yeast can be a bit of a crap shoot for a wine maker. To give a small bit of scientific background, yeast is the living organism found naturally on grapes that eats the sugar in the grape juice and produces alcohol - that's the fermentation process. In modern winemaking, it's common for winemakers to kill the natural yeast and instead start fermentation with purchased yeast. That's because, in addition to causing fermentation, yeast also produces compounds that contribute to the wine's flavors. 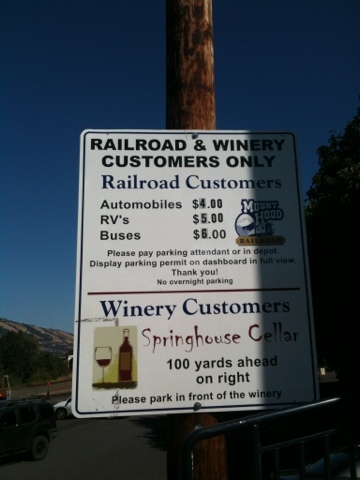 With purchased yeast, they know what flavors the yeast will bring to the wine. With mother nature, you don't know how it will turn out. 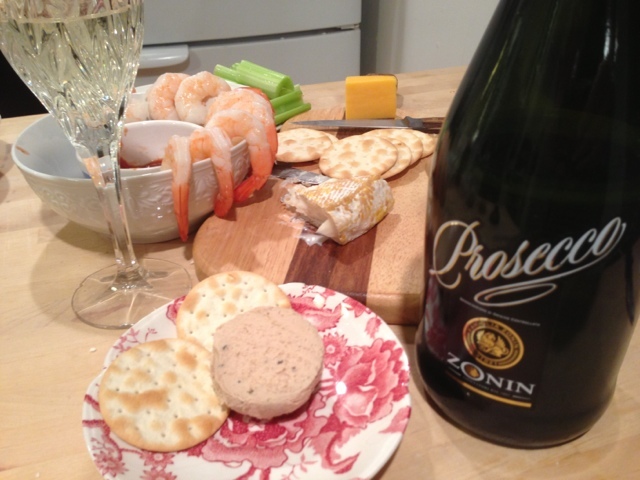 Using purchased yeast can produce a consistently palatable wine. However, that consistency can be a little bit predictable, a lit bit bland. While problems with using wild yeast exist - fermentation may stop before it's done, off-flavors can develop - many winemakers recognize that it can provide layers of complexity to the wine, and that was certainly the result here. I like the label of The Wild!, which features energetic swaths of colors and also the use of the explanation point in the name of the wine. This winemaking technique is exciting, and the results are too. I've said before that it takes a special Chardonnay to win me over, and this is one of the rare ones that does. When the wine being poured is just so so, it's nice to reach for a specialty cocktail. Last night the whites at the New York Travel Massive, a monthly gathering of travel industry and blogger types, were showing their age. And, just like Grandma's wedding dress, we're sure they were lovely back in the day. But now, just like old satin, these were yellow and no longer fresh. 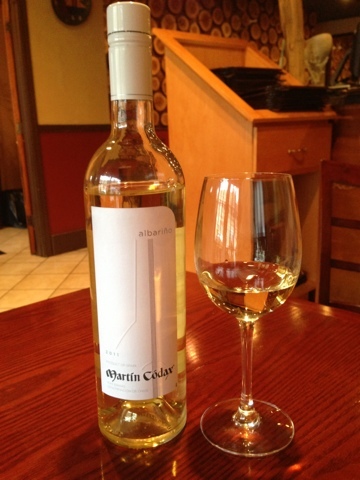 For example, a 2008 Albarino should not be poured for anyone you like. I met Mike DeSimone and Jeff Jennson years ago at Kevin Zraly’s Windows on the World wine class, when I was a neophyte wine lover and they were guest speakers. I always knew the duo as the World Wine Guys, so I was surprised to run into them in Manhattan fresh off of a day promoting their Fire Island Cookbook. Because man cannot live by wine alone, it turns out they are also very handy in the kitchen. I’ve always found the pair to have a wonderful breezy attitude and an appreciation for the good life – and it all comes through in this new book. If you’re not from around these parts, you should know that Fire Island is a very special shore destination beloved by harried Manhattanites. The lovely strip of beach is a true getaway: no cars are allowed and it’s only accessible by boat. It’s one of New Yorkers’ favorite summer rituals to board the ferry on Friday afternoon. By the time the crossing is finished, stress has eased away and smart phones aren’t used for work anymore, just texting friends to meet at the nearest bar. Yet while the island is relaxing, its residents have casual chic down to an art form, and this comes across in the beautiful photography of the summer fresh fare in the book. Each chapter has a full dinner party menu, from appetizers to mains to desserts and--since the two are experts in the vinous pleasures of life--wine pairings. The menu themes reflect their love of travel: Mediterranean Odyssey, Villa in Tuscany, Portside in Puerto Vallarta. With recipes like Gazpacho, Greek Yogurt with homemade Fig Compote, Bistecca Alla Fiorentina, Herbs de Provence Grilled Lambchops -these are like four star vacations in a meal. The recipes make sense for the rhythm of beach life, with many being light and easy to prepare, and others – I love this – being elaborate preparations for those days when sun and fun are rained out. 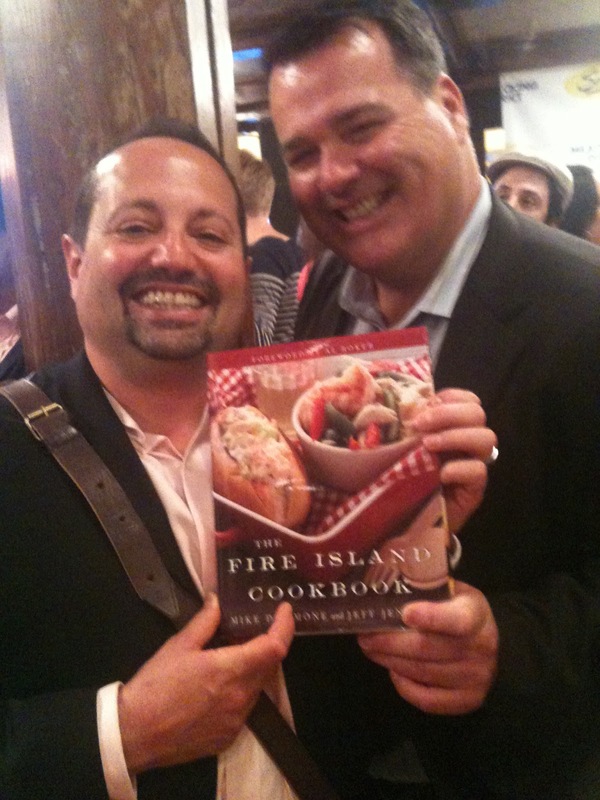 With Memorial Day Weekend less than seven days away, I’m ready for summer, sand, and taking a spin in the kitchen with the Fire Island Cookbook. I arrived in Fiumincino Airport this morning with no set itinerary, no lodging, and only a vague idea of what I wanted to see. However, I pride myself on being a nimble traveler and knew there was so much to see and do in the Eternal City that I couldn't go wrong. I immediately ran into a fellow wine blogger, Robbin, and plans quickly were hatched. She had a bed booked at The Beehive, a happily located hostel a mere three blocks from Termini Station. For 40 Euros I had a cheerful private room with fresh modern styling punched up by neon orange accent pieces. Seeing Rome with little time and less energy due to jet lag is a challenge that was easily solved by the 110 bus, a red double decker with an open air top that followed the route of the major historic sites. Before boarding, we were treated to a spectacle of a loud parade of protestors waving red flags that was led by a tractor trailer blasting, as Robin said, Italy's most famous rapper. 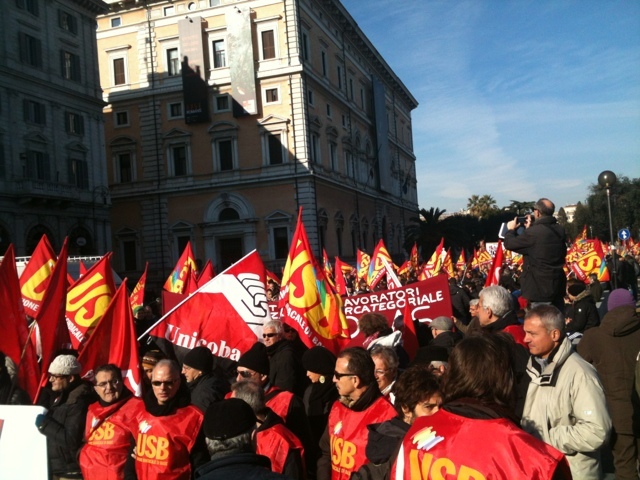 They were calling on Italy's new prime minister to fix the mess left by Berlusconi. After ten minutes, the parade passed and we mounted the 110. As a bright January sun warmed me in the fresh air, I was entranced by thousands of years of history passing by: the Coliseum, with the audio guide reminding us of the captives being eaten by "wild animals;" Circus Maximus, where the Romans held their beloved horse races; and palaces, fountains, and piazzas too numerous to mention. But it was St. Peter's Square where we disembarked. I reasoned that it was a place unique in all the world and most deserved my time. The line to enter the basilica was depressingly long, so we took a detour to lunch at a stand up Pizzeria a few blocks away. Robin told me that after the dough is made it rests for three days, giving the thick crust large pockets of air that make it light. 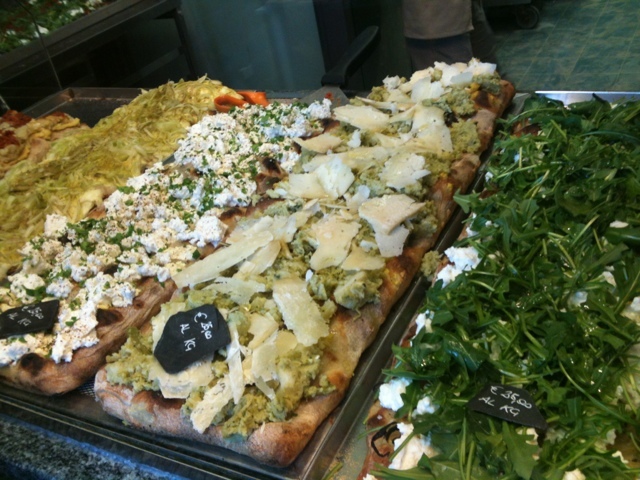 We ordered slivers of three types of pizza: a tomato sauce pie with small slices of tomato on top - I had never tasted such sweet tomato sauce, a pie with a mashed broccoli and soft cheese, and a pie of soft roast potato slices and cheese. All were wonderful, but the tomato pie won my heart. Returning to St. Peter's Square, the line had miraculously shrunk and after our bags and coats went through X-ray scans, we were in. I had visited Rome many years ago and was eager to see La Pieta, Michaelangelo's moving sculpture of Mary seated mourning her deceased son, who lies across her lap. The gentle humanity of the scene of a mother in mourning always moved me. Of course the grandeur of St. Peter's is so great that only the most jaded could fail to be impressed. 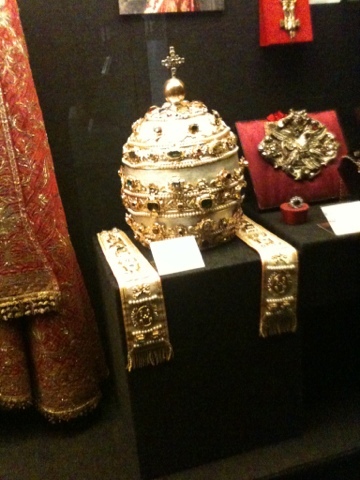 I paid the 7 euros to enter the small museum inside the church where assorted Popes' gold embroidered vestments and an enormous jewel encrusted miter caught my eye. The day ended at a small enoteca, drinking Langhe wine and chatting with new friends. In the end, I was incredibly grateful to return to this magnificent city, if only for a day. Noble Rot, or botrytis cinerea as it is scientifically called, can be cause for great joy among winemakers. Because while other types of mold are harmful to grapes, this one actually can shrivel the grapes in such a way that they are perfect for dessert wines. 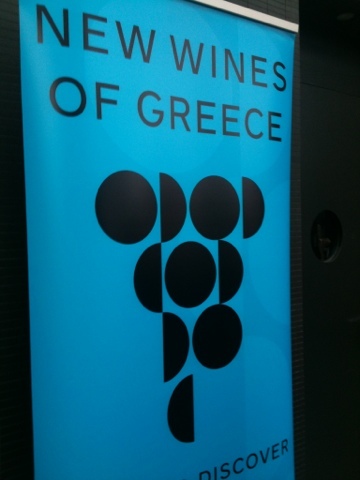 There are some places in the world that are well known for producing sweet wines from botryitzed grapes. Sauternes is the most famous region, as well as parts of Germany, Austria, and Hungary. 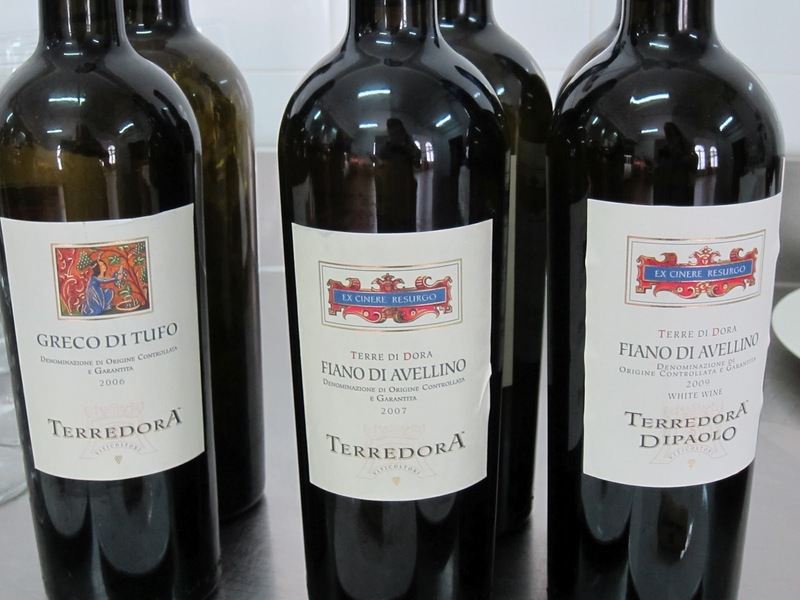 However, it is a rare thing indeed for any Italian winery to produce such wines. 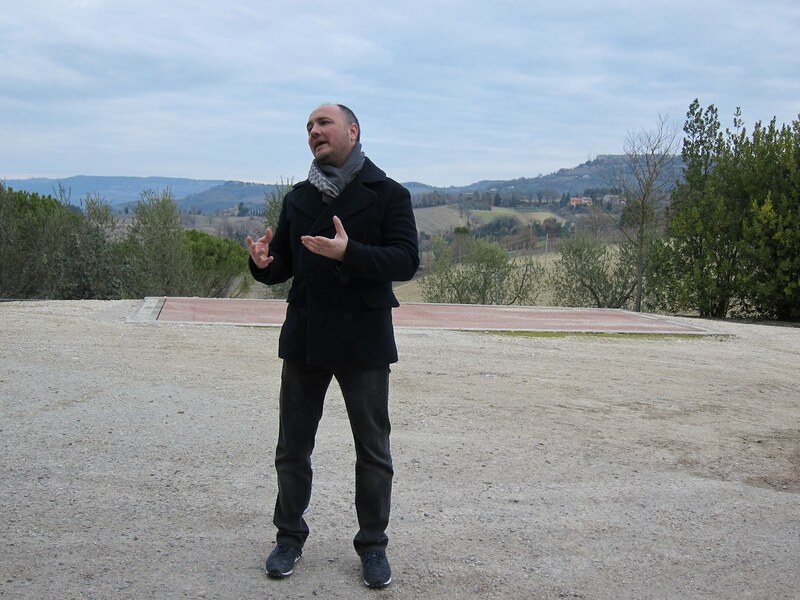 On a recent visit to Barberani winery in Umbria when I traveled with bloggers from the International Wine Tourism Conference, I had the chance to taste one such wine. Bernardo Bernardini led our group on a tour of the vineyards and winery, ending in their charming tasting room. We were fed thin, sweet slivers of local ham and salami on crusty bread, and led through a tasting of their high quality Orvietto Classico as well as delicious red wines. However, it was their dessert wine that intrigued me. Apparently, the region used to produce sweet wines but this style of wine fell out of favor, and for decades everyone vinified their wines dry. But a funny thing happened in the early 1970s. Barberani forgot to harvest a parcel of land, and when it was discovered, some of the grapes had been affected by botrytis. The forgotten vineyard was harvested and a small amount of sweet wine, known as Muffa Nobile, was produced. Robert Mondavi was dining with a distributor in California, who brought a bottle of the sweet wine to dinner. 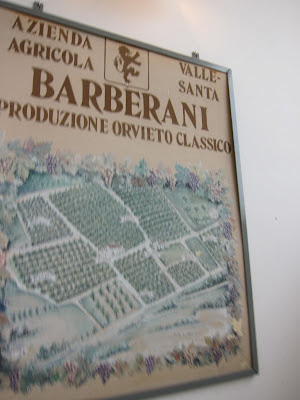 Robert telephoned the senior Barberani in the middle of the night Italian time and congratulated him on his noble rot wine - and with that, it was decided that producing sweet wine in Umbria again was a very good thing indeed. On my visit, I tasted the Calcaia 2006, a Muffa Nobile Dolce. Amber colored, with notes of apricots and honey, it was a lovely dessert wine that was bright and not cloying. I bought two bottles and will toast the innovators at Barberani when I drink their sweet sipper. I spent Valentine's night in a rather unusual location: The New York Transit Museum. Valentine's Day is not a holiday I put a lot of stock in, but a free party was too good to pass up. Right away I noticed this was not your average museum: you descend into the museum through a genuine (albeit no longer in use) Subway entrance. When I asked, "How much?" I was told the party was free and handed two drink tickets. 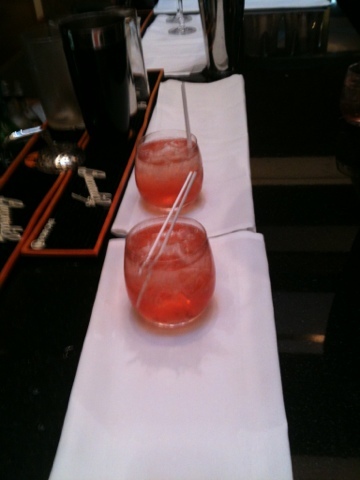 Is there anywhere else in New York that will give you a couple of free drinks as well as entertainment? I was already a NY Transit Museum fan. My drink tickets were put to good use with Le Jaja de Jau, a Sauvignon Blanc from the Cotes de Gascogne. While Gascogny is more known for producing France's beloved aged spirit, Armagnac, it can apparently take Sauvignon Blanc grapes and create an almost New Zealand-style pour: grassy, big nose, clean and refreshing in its acidity. Nicely done, Gascogny. The party included live music from You Bred Raptors, an unusual trio from Astoria who wear Carnival masks and create nicely rendered experimental/folk/jazz songs. 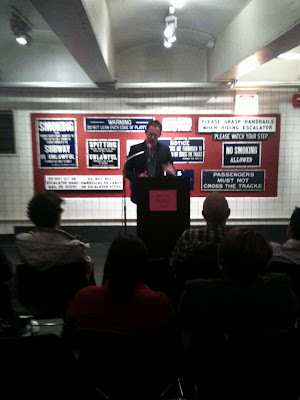 But the grandest entertainment of the night was Alan Feuer. who trolls Craigs List Missed Connections for unusual and unintentionally hilarious postings. According to Alan, all he does is add line breaks and these postings become poetry. Yet it was Alan's masterful delivery of these missives, replete with varying voices, animated gestures, and the rare accent that made these heartful soul-bearings of the Internet poignant indeed. 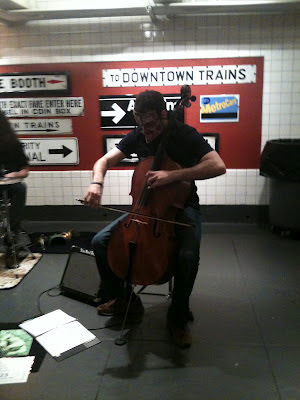 I highly recommend a visit to The New York Transit Museum. Especially for an unusual and fun Valentine's celebration. "I'm making Seafood Fra Diavolo" was the text I received while cranking up My Chemical Romance as I worked up a sweat on the elliptical at my Jersey City gym. My first thought was, "Yay!" My friend Jordan is an accomplished seafood cook, and I was looking forward to his rendition of this spicy treat. "Fra Diavolo" is from the Italian "brother devil," and the dish is believed to have come from Italian immigrants in New York City in the early 20th century. The concoction of seafood - which can include a chef's choice of shrimp, calamari, lobster, and other fish - tomato sauce, and of course the element of heat, in this case from a few chopped dried Serrano chiles, is a powerful mouthful of flavor. So, my second thought was, "What wine will stand up to all that heat and flavor?" 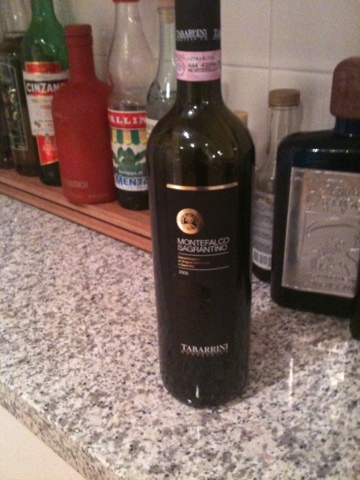 Luckily I had a bottle of Sagrantino di Montefalco on hand, a 2005 Tabarrini. It's made from the Sagrantino grape, indigenous to Umbria, that is grown in Montefalco and several surrounding villages. 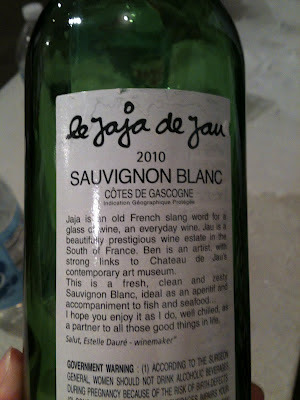 I'm fascinated by small-production, unique wines, and this is one that is completely specific to its native land. The dinner was great - our Fra Diavolo was a fun mix of interesting flavors, shapes, and textures: shrimp; small, sweet scallops; and cod. The Sagrantino did not shy away from the rich spicy flavors. It was like two Roman gladiators well-matched in the Coliseum. But these big boys weren't fighting each other. 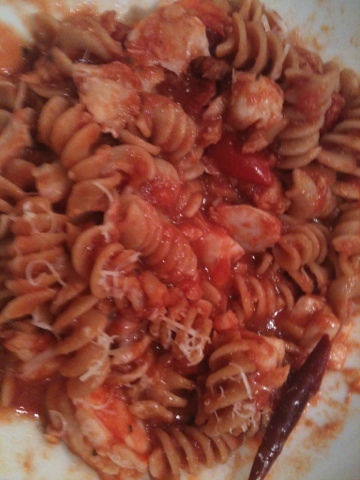 Unlike in Ancient Rome, the powers of Sagrantino & Seafood Fra Diavolo blended harmoniously, albeit with brashness.